Xylitol is an unusual type of sugar (wikipedia page) that appears to be gaining traction in dental circles. From my research, the general idea is that xylitol functions as a kind of trojan for bacteria. The bacteria eat it up the xylitol thinking it is a regularly structured type of sugar, but instead, it impairs the bacteria's ability to reproduce. I have read compelling articles that cavities are primarily the result of plaque acidity. And plaque is a byproduct of bacteria. If the bacteria can no longer reproduce after consuming the xylitol, then they die out and do not create runaway colonies in your mouth. In addition to drastically reducing the bacteria populations in your mouth, I have seen studies that look very promising for increased dental remineralization using xylitol. I would like to understand better how significant this remineralization is likely to be, but from my reading, it could at least stop and reverse small cavities. I buy xylitol crystals and a keep little cupful with a spoon next to my toothbrush. After brushing at night, I put a spoonful of the crystals in my mouth. It quickly dissolves into a rinse which I swish around while I'm doing other things. After a few minutes, I spit it out and that's that. In regards to eating Xylitol: I've seen quite a few studies published online where people also consume xylitol and it seems to produce fantastic results (drastically reduced cavities), but I've seen a few comments where people attributed increased liver enzymes to xylitol which made me nervous. Until I am convinced eating the xylitol won't put a heavy burden on my liver, I'm not going to eat it for now, only use it as a tooth rinse. The more I read about fluoride, particularly the form used in our tap water and toothpastes (sodium fluoride), the more I think it is a terrible idea. (Calcium fluoride in trace amounts is the naturally occurring form of fluoride; sodium fluoride is usually an industrial byproduct.) For me, I do not want to risk messing with my endocrine system, thyroid function, or other bodily systems in general. On top of that, after dutifully ingesting quantities of sodium fluoride my entire life (I was a sucker for following orders), after my last unfortunate orthodontic treatment, most of my teeth have all sorts of vertical fissures. To me it looks like an indication that even though sodium fluoride may have had an effect on dental enamel, the enamel may not have formed with the intended elasticity, and instead made my teeth more brittle than they should naturally be. I would infinitely prefer testing these other methods to strengthen my enamel. Enamel remineralization appears to be a fringe topic in dentistry, but the encouraging signs out there seem to be related to maintaining an alkaline balance in your saliva. So even if you took care of the bacteria issue with xylitol, if you ate a particularly acidic meal (or drank lemon juice), the acid left behind in your mouth could reduce the chance for your teeth to remineralize. To be on the safe side, if I ever consume acidic food or drinks, I put some baking soda in a bit of water and rinse my mouth. Sometimes I can even hear the fizz as the acids and bases cancel out which is pretty interesting! Seems worth testing to me. Even though my paleo + raw foods strategy has drastically increased the amount of natural vitamins and minerals I'm consuming, I make sure to add extras of Vitamin C. In my reading, Vitamin C seems to be very beneficial at strengthening arteries and reducing bruising. If it does that, I think it would also help prevent bleeding gums (which are maybe a sign of a vitamin C deficiency? I'd love to know if there are any studies on this). My strategy to help out my liver is to get Vitamin C from natural sources (not ascorbic acid), so I consume Acerola Cherry Powder (I've been mixing it in water with MSM) and Rose Hip Tea. Eating enough fat soluble vitamins is also part of my dental strategy. In particular, vitamins A and K2 appear to be particularly compelling. I'm finding more and more that the relationships or ratios between vitamins is a key factor; just one of the reasons why I've moved away from isolated supplements and instead to whole food sources for my 'medicine'. The forms of the vitamins change depending on whether the source is plant or animal based. Even though our bodies have some capability to convert ingested vitamins into the form we need, some forms are easier to convert (bioavailable) than others. For example, in order to facilitate making Vitamin A from Beta Carotene (from carrots), I include a bit of some kind of fat (avocados, nuts, ...) when eating vegetables or greens. I also include some kind of liver in my diet nowadays (beef, cod, or oysters - for primitive organ meats). The Weston A Price Foundation is a decent source of info on the benefits of traditional food strategies including fat-soluble vitamins. The benefit of a paleo + raw food strategy is a significant increase in the amount of minerals consumed and a drastic reduction in processed sugars. My strategy is to use green juices (basically juiced leafy greens + carrots) for an easily absorbable infusion of minerals. (I have some more thoughts about green juices in a previous blog post) The more varieties of greens, the more variety of minerals. I have also been drinking strong teas with high silica content (oat straw + nettles + horsetail. I actually make a 'decoction' which is a stronger tea: Basically I mix a few tablespoons of each herb in a glass jar with boiling hot water & let it sit overnight. (Unheated water also seems to work well in a pinch; wish I could compare the resulting nutrient ratios; seems like the heated water does make the tea darker.) These herbs are usually associated with strong bones; I figured it was worthwhile to test for my teeth as well. Baking Soda, Zeolites (even the finest grain you can find), and activated charcoal are known to be abrasive on your gums, so I make sure to brush primarily on the tooth enamel only and keep an eye on my gums to make sure I haven't overdone it. I am also concerned about how much the scrubbing action effects dental enamel (even though my hygienist said my enamel looked good at my last visit); to be on the safe side, I only use the scrub once every 2-3 days or so. Posted by Laura A Knauth at Wednesday, February 27, 2013 No comments so far. Comments Welcome! One of my favorite quotes. I love writing novels, even though they are categorized as fiction – a term that most people equate with 'false' or 'made up.' The implication is that novels are a waste of time, or not serious, not worthwhile. In writing novels, I in no way think I am wasting my time or anyone else's. Non-fiction (reality) must only be possible; Fiction must be probable. Non-fiction (reality) is random data points; Fiction is a hypothesis. If the fiction, the hypothesis, rings true, the reader's entire perspective on life can change. Perspective shapes motivation; shapes action; shapes results. What resonates with the reader can be the overarching theme of a novel, a particular scene ... a particular phrase. The point is the reader (the receiver) is actively engaged. A bar has been set, and it may be high. The author must transmit something useful, that passes the standards of the reader, or it will be utterly discarded. Non-fiction, memoirs included, presents itself as an unquestionable fact. The reader is obliged to suspend disbelief; to accept. This account must be accepted since it is 'true'. Non-fiction is usually compelling when it describes an extra-ordinary event; a corner case. This is usually outside the experience of the reader, so it provides a valuable broadening of perspective. Readers can learn about a remarkable event in condensed time without being exposed to physical danger, and build a world view from a larger foundation – incredibly valuable. Unfortunately, this aspect of non-fiction can also be abused, either well-meaning or otherwise. I am particularly annoyed by many works of fiction that present themselves as memoirs. I see it as an underhanded ploy to remove the standards set by the challenge of writing quality fiction. Fictional memoirs, such as Memoirs of a Geisha, that present themselves as non-fiction for added 'realism' artificially bypass a reader's healthy skepticism. (I love insights into new worlds, and had thought it was a good book when I first read it, but was under the impression it was a true memoir at the time, so now I don't remember how much of it I would have thought was contrived had I known it was fiction.) These books reap the benefit of the readers unquestioning acceptance of a 'truth' - an abuse the readers enthusiastic desire to learn. In the short term, it generates exaggerated interest and bolsters the author's sales; in the long-term, it only serves to mislead; create noise; cloud judgement. Writers of fiction essentially allow the world to label them as false, and have only hope that the truth will resonate and be useful. It is certainly true that many novels of fiction seem trite, contrived, random, pointless … and maybe they are, but that's fine. Bad ideas from one person's perspective, might provide someone else with a valuable benefit. Some food might be empty calories, but other entrees might be both delicious and nutritious. It's an individual choice. Over time, the most resonant fiction survives the ages and continues to inspire new generations. That is a challenge, but a worthwhile challenge. I've been in the process of researching the ancient world for at least the past 10 years. It will be an underlying foundation for the next series of novels I am about to write. Just one of many layers that I hope will help give the stories added value and meaning even if all that background work is barely noticed. (For me, it's already been an unexpected and amazing journey to see the larger patterns of history and the motivation behind many aspects of our lives we take for granted. One of those unexpectedly tied in with food and how grains became a main staple of our diet. It in part provided motivation to re-evaluate this and experiment with the Paleo diet – a previous blog post.) For my first novel, I did create the world from the ground up, but then realized that if the world was set in our own remote past, that readers would have the opportunity to learn about or own history without any extra effort on their part. As I'm doing my research, if I ever need to talk to someone in academia, I've found it best not to even mention that my research is for fiction, because all too often the common response is something like: "Oh, then why bother with facts? Just make something up, if it's fiction." #$(^@&!!! Posted by Laura A Knauth at Monday, February 25, 2013 No comments so far. Comments Welcome! Testing out a paleo + raw foods strategy involved removing most of the foods I was used to eating every meal: breads, pasta, rice, beans, and all processed sugar. At first, I definitely remember wondering what else there is to eat. :) Turns out, there is quite a lot. (For another post.) Most people who see me eat nowadays marvel at the quantity of food I am consuming. By volume, I consume a lot of greens & vegetables (for vitamin, mineral, and water content), but those are very low calorie. Fruits do have some calories, but even eating several servings a day does not really put a dent in my calorie goals. Once you eliminate grains, legumes, and sugar from your diet, it is actually some work and planning required add in enough calories per day. After lots and lots of reading, I have become extremely skeptical about the mainstream health advice which advocates avoiding fat. (Trans fat and other oxidized fats, yes, by all means, I agree those should be avoided.) Instead, I am testing an approach where most of my calories come from high quality fat sources; namely avocados and mature coconuts. Mature coconuts contain mostly medium chain saturated fats (http://www.ncbi.nlm.nih.gov/pubmed/3519928) While I suspect fear of saturated fats in general is misplaced, the medium-chain saturated fats in coconuts is metabolized entirely differently then other types of fats (seems to even bypass the need for bile from the gallbladder). Mature coconuts are also very high in calories which is where I get most of my energy nowadays. I try to eat at least 1/2 a mature coconut (morning smoothie) and 1 or two avocados (dinner) per day which is my baseline calorie level. From there, I add in a variety of fruits, and some portions of meat to add on more calories. I estimate my macronutrient levels are roughly: 60% fats; 15% animal-based protein; 25% carbs. I plan on getting a vitamin & mineral blood test in the spring to monitor the results of my food strategy & will post the results. Besides providing high quality fatty acids and calories, coconuts offer so many other compelling nutritional benefits. The liquid inside the coconuts (coconut water) is so compatible with human blood that it was used in transfusions during WWII (http://en.wikipedia.org/wiki/Coconut#Medicinal_uses). I am also impressed by the vitamin and mineral content both of the water and the meat. Coconut meat can be blended with water & strained to make you own coconut milk & coconut flour. Even though stores are starting to sell coconut water, coconut milk, and coconut flakes, I would prefer to buy my own coconuts & make these myself, in order to have the highest quality food for the lowest cost. In the produce section, you will probably find both young and mature coconuts. The young coconuts, also called Thai coconuts, are cross pollinated with date palms and are very sweet with a much lower fat content than mature coconuts. You will usually find these in the stores wrapped in plastic with white husks shaped into a point at one end. The young coconuts are completely filled with water, so you won’t hear anything when you shake them. There are quite a few YouTube videos showing people opening these. You basically hack off the top, drink the water, and then scoop out the soft meat with a spatula (or a spoon). The meat inside is very gelatinous and can be blended with water to make a nice custard. (All of these could also be fermented to make a coconut kefir or coconut yogurt.) Unfortunately, I have not seen any organic young coconuts in my stores, and I am concerned that imported coconuts might be irradiated ‘for your safety’. Since my food strategy involves reducing sugar, increasing high quality fats, and buying organic whenever possible (for stricter quality standards), I almost exclusively buy mature coconuts. Mature coconuts have a hard round shell (brown or white). The meat is much more developed than the young coconuts and they do not contain as much water. You should hear the water sloshing around inside when you give it a shake (the heavier the better). 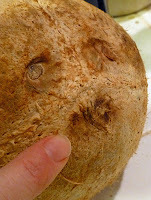 I would avoid any coconut shells that have cracks or green/black mold spots on the eyes (the whiter the eyes, the more likely it is to be fresh). I think the main reason these things have not caught on is the challenge of getting into them! (And before I knew about those tips on how to pick out coconuts, I ended up with many bad ones – an expensive lesson.) Even though there are various strategies online about opening mature coconuts, I have some of my own tips & tricks and thought I’d share. Coconut Knife, Coconut Tool, Coconut! Check out the three 'eyes' on the coconut. It's actually better to think of them whimsically as two eyes and a mouth. You can just use a screwdriver (larger is probably better) to poke a quick hole in the ‘mouth’ opening. If you’ve properly identified the mouth, it should be no trouble to twist with light pressure until the shell breaks & you are through the meat to the inside. Early on, I’d bought the Coconut Knife to punch a clean hole in the coconuts; it’s not essential, but since I have it, I’m still using it. When you fully punch through the meat, you should hear a rush of air (like opening a can of soda) which indicates the coconut is probably fresh (still sealed from the outside environment). Many people punch a second hole for better pouring, but this will be a lot more work going through one of the eyes compared to the mouth. I just invert the coconut over a glass and do other things for a minute while the water drains. I'm pointing to the 'mouth' opening. ** When things go bad: If the water inside is very yellow or has cloudy streaks, it will probably also have an off taste ... sour? (not sweet at all). I usually sigh, toss it out, and try another one. I don't even bother opening coconuts with bad water the rest of the way. I usually end up seeing some sort of mold between the coconut meat and the shell when this happens. The mature coconuts are no where as sweet as young coconuts, but still should taste slightly sweet. There are varying degrees. If the coconut seems to have gone slightly bad, I haven't risked eating it. I definitely have had good luck keeping coconuts for 3wks to a month in my refrigerator. Whenever the coconuts sit out at above 60-70 deg F, they seem to go bad in just a few days. Put on safety glasses. I started doing this after two occasions where a piece of shell flew back and hit me in the cheek. I figured if it can do that, it could just as easily hit my eye, so I feel much more confident wearing some eye protection. Hold the coconut in one hand. I also wear a mesh kitchen safety glove on that hand because the coconut shell can pinch while it's splitting open. Putting the coconut (wrapped in a towel or plastic bags) on the ground outside is another option, but I find it too messy & unstable. Firmly strike the coconut along the rim with the *flat* side of the cleaver (OPPOSITE the sharp edge). Just to be clear, the sharp blade of the cleaver should be no where near your hand or any other body part during this entire process. I would put a smiley face because I never thought I'd write a sentence like that, but this is pretty serious. You could use a little hammer instead, but I don't think it works as well. Try to strike midway between the eyes (top) and the bottom of the coconut. The shell will have a tendency to split in a circle around the circumference. Continue wearing the safety glove in the hand you will use to hold the coconut shell. I don't use safety glasses for this part, but definitely still wear the glove. I find the Coconut Tool is the most valuable equipment to remove mature coconut meat from the shell. When I was new to coconuts, I first tried using a butter knife, but really don't recommend it. I've spent over 30 minutes trying to get at the meat this way & nearly cut myself several times. 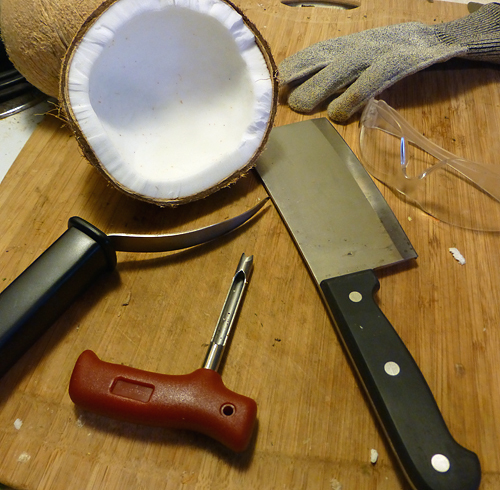 In my opinion, the most valuable gadget I recommend for coconuts is by far: the Coconut Tool. Wedge the curved blade between the meat and shell. Twist as much as you can & work you way around the perimeter increasingly wedging the knife deeper and deeper. Some coconuts are tougher than others to release the meat, but usually in a minute or two, the complete hemisphere pops out (or in a few pieces) using this method. I wear the safety glove mainly because the last piece usually gives way more quickly than expected; there have been a few occasions where I was very glad to be wearing a cut-resistant glove! You can even blend up the pieces with water at this point and then strain it through a nut milk bag (or other fine mesh bag) to make coconut milk. The left over fiber (coconut flour) is a fun substitute to use in baking. In order to save on costs, I buy my coconuts in bulk. Different stores have different bulk discount rates. I think Whole foods is 10% off when buying by the case, but I found a local health food store that is at least 40% off (basically a marginal rate above wholesale). Even though I love coconut oil, and do buy it buy the gallon (saturated fats are highly stable even at room temperature and in cooking) it has gone through a manufacturing process, so I'm once again skeptical about what shortcuts may have been taken. Your best bet is to look for the words 'organic' (legal standards) and 'cold pressed'. (The words 'raw' or 'natural' do not have any legal requirements, so don't convey any useful information.) Higher temperatures in food processing such as with the Expeller Pressed (or worse) increasingly reduce the quality of the food. At extreme temperatures, the food usually smells bad, so is bleached and artificially scented (doesn't sound good to me). I've now started to see Cold Pressed Organic Coconut oil at Costco. I've also bought it in bulk online at (www.therawfoodworld.com) Coconut oil can be used as a moisturizer for skin, hair, nails & all sorts of uses. The more I read about coconuts, the more I love them! Full of vitamins & minerals, and has antifungal and antibacterial properties (against the harmful kinds or bacteria, but coconut water/milk can be fermented for beneficial probiotics). For my main food souce, I prefer buying the whole coconuts directly – no stabilizers, no additives, no bleaching, no who knows what. I recommend learning to open the coconuts yourself for the highest possible quality of an amazing and versatile resource. Coconuts for the win! Posted by Laura A Knauth at Wednesday, February 20, 2013 No comments so far. Comments Welcome! 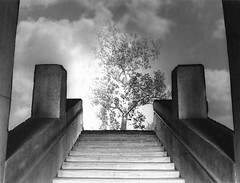 One of my favorite filters to use in photography is what I call, the ‘zen filter’. It can turn ordinary snapshots into paintings – glowing waterfalls, playful water spirals, an impression of moving waves across a grassy field. I refer to none other than the 6 stop ND (neutral density) filter – essentially a color-neutral darkening filter (almost black), so that more light is required to properly expose the picture. For the same aperture, the requirement for more light translates to a longer exposure time. For twilight images, this can mean a 30 second exposure; for mid-day waterfall shots, this can mean a 1-2 second exposure (instead of fractions of a second). Most commonly available ND filters are one or two stops, but I find the images truly become magical at or above 6-stops, where the shutter speed slows down considerably. Here is an example of one of my photographs using a 6-stop ND filter. (This is Palouse Falls, in Washington.) Notice how the waterfall almost appears to glow. The longer exposure time allowed for the spray of the waterfall to merge into a beautiful blur, and the bubbles across the river surface merge into elegant streaks. Most of my shots with a 6-stop ND filter are in the 30 seconds to 1 minute exposure range which means that any motion during that time will become a blur-effect in the final image. This motivates a different way of looking at the landscape while you are composing an image. Instead of freezing all motion and quickly snapping shots left and right (which is also fun & very creative), the ‘zen’ filter is a change of pace. Now, instead of just framing the line of a river, for example, you start noticing the water bubbles floating on top of the water (that you may not have particularly noticed in a freeze frame) might create a compelling pattern that can become the centerpiece of a 6-stop ND image. So, instead of rushing to capture what you immediately see, your images benefit greatly from stopping to notice the larger patterns of motion across the landscape – hence, more of a ‘zen’ experience. Notice repeating patterns, and then photograph what will happen, not what is happening right now. Your photograph becomes an image not only of dimensions, but an impression of time. The only down-side of a 6-stop ND filter in my opinion is that it essentially requires a tripod. Most shots work well if objects in motion are balanced by other objects that are crystal clear. I think this provides perspective & shows technical intent. Tripods and I have a difficult relationship. On one hand, I find they are a necessity for me to obtain high quality images, but they put an extreme inertia in the field. I want to freely move the camera around composing images, but end up moving at a snail’s pace (missing cool lighting opportunities along the way), as I fiddle with the levers and leg angles. And just when I think I have the shot lined up, many times the tripod configuration is not quite stable and will shift around at the slightest touch. Grr. Needless to say, my tips for using a tripod are still a work in progress. If you know of any awesome tripods, let me know! It’s heavy and cumbersome, but I’ve noticed a huge improvement in my images when I use it. I’ve tried out using a gorilla pod (Joby GP8-BHEN GorillaPod Focus with Ballhead X bundle) on my recent trip to the Grand Canyon. It was much more portable and flexible, but is fixed at just a few inches off the ground (or whatever rocks or railing you might be able to put it on). The ball head mechanism is just at the range of what will hold my SLR camera. I’m using a Canon 50d and am slowly building up a lens collection. I wouldn’t use my largest lenses with the ball head that came with the gorilla pod (it doesn’t hold the vertical shots properly for a long exposure). So this tripod has trade-offs, as with anything, but seems very promising to me so far. I will post an update as I use it more. Even though I love the 6-stop ND filter, if there is no significant motion in the scene, the most useful photography accessory to buy in my opinion is the circular polarizer. When you rotate the circular polarizers to block out reflections on leaves/rocks, it really has a magical effect on the colors and also reduces unwanted contrast. And also, if you use a polarizer combined with a smaller f-stop (I find f/11-f/13 is the sharpest for my lenses anyway), you will usually have a couple of seconds per exposure which can also blur the water enough to create blur/diffusion effects. The 6-stop ND filter is an extreme version of this (which I love). Since lens filter threading size is non-standard across lenses, and good quality filters (that do not degrade your image) are *expensive*, I learned a valuable strategy: only by the largest sized filters, 77mm. Then buy step-up rings to fit onto your particular lens (ie: 72-77mm step up ring, 52-77mm step up ring, etc ...). The majority of the fancy lenses are 77mm, so as you upgrade, you will most likely be able to use you 77mm filters on all subsequent lenses. As an added bonus, I leave these step-up rings on the lens when I'm not using the filters. It acts as a sort of protection and rudimentary light shield for the lens.I can also buy spare 77mm lens caps to interchange with all of my other lenses (and their step-up rings). I have found this strategy has greatly streamlined the process of changing lenses & filters out in the field. Posted by Laura A Knauth at Saturday, February 09, 2013 No comments so far. Comments Welcome!